Irish countryside Burren is one of the most extraordinary places. There are no forests mountains, Lush green meadows and pastures, but there is something else. The entire Borough is a unique karst region with a total area of 300 sq. km. Located in the western Irish county of Clare. The uniqueness of the area comes from a series of eroded limestone spacious grounds, forming a network of intersecting cracks, called "grykes". Under the limestone slabs themselves are huge leaf caves and underground rivers. Along with the natural uniqueness of the local landscape, Burren has a great history, now representing important archaeological field. More than 90 megalithic tombs, portal dolmens, high Celtic crosses in the village of Kilfenora, and several circular Castles etc. only a small part of the historical heritage of the Burren. One of the most interesting objects here is Poulnabrone dolmen. Furthermore, on it can be seen a triple protected ring Cahercommaun, best preserved Caherconnell Stone Fort, and the ruins of the abbey of 12 century-Corcomroe. 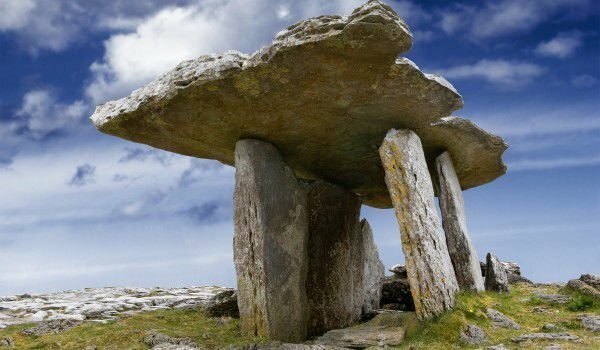 More than seven megalithic dolmens were discovered near the Borough, the most famous of which is definitely Poulnabrone. Among other things, this place is the most easily accessible. Defined as the tomb portal, Poulnabrone is located 8km south of Ballyvaughan in the parish Carran and 9.6 km northwest of Kilnaboy. Sanctuary Poulnabrone dates from the Neolithic Age, probably between 4200 BC to 2900 BC literal translation of the name Poulnabrone means "hole of grief." Poulnabrone, is a portal tomb consisting of two high 1.8 m stone pillars, on which rests a large stone slab. The sanctuary has the shape of a real door or portal, which looks to the north. Slightly tilted sideways, as it measures 1/2 meters long and 2 meters wide. Poulnabrone was discovered in 1968 when excavations were conducted at this location. In this special tomb were found the remains of bodies from 16 to 22 adults and 6 children, including a newborn. According to the analysis of carbon bodies were buried between 3800 and 3200 BC. Historians claim that Neolithic settlements were quite spacious, and the burial of the dead there would be much easier, this fact leads scientists to believe in Poulnabrone were buried only selected people. Moreover, Poulnabrone was a place for ceremonies and ritual activities.